Imagination and Magnetism: Paracelsus and the Consequences“ . in Glasgow, September 17, 1993. Heinz Schott, „‚Invisible diseases’—Imagination and Magnetism: Paracel­sus and (he Consequences,“ in The Man and His Reputation, His Ideas and Their Transformation, ed. Ole Peter Grell (Leiden: Brill, 1998), 309-21. Some scholars of Paracelsus‘ work showed him as a harbinger of psychosoma­tic medicine. Thus, they interpreted his wellknown treatise De causis morborum invisibi­um (On the invisible diseases) as an essay pointing to modern theories of medical psychology and psychotherapy, in spite of its occult, magical and even cabbalistic impact. I claim the opposite perspective. I assume that the occult, magical and religious content of Paracelsus‘ writings is reflected in modern psych­somatic medicine in a secularized form. To this extent, modern concepts, especially the Freudian paradigm, are disguised latecomers from the period of the Renaissan­ce. The currents of the natural philosophy and the specifically scientific approach of the Renaissance are hidden today, but they are still alive. When we study the different psychosomatic concepts in the history of medicine, we generally notice the double character of psychosomatic ideas. On the one hand there are ideas, pictures, illu­sions within a person’s mind which may imprint themselves upon his own body or infect other bodies by communication. We may call this the power of imagination (Vor­stellungs- or Ein­bildungskraft). On the other hand there are energies or natural powers which correlate the individual organism with the whole organism of nature. This we may call the correla­tion between microcosm and macrocosm. The most essential idea of natural philoso­phy, from the Stoics up to romanticism, claims that all bodies, including the human organ­ism, are connected by networks of magnetic influence. This concept of magnetism, especially the concept of sympathetic interaction, covers the energetic pro­blem: the trans­ference of vital powers within the body or from one body to another. Imagination plays a great role in the history of medicine. The images of visualized pictures may represent healing powers (Sigmund Freud’s „Eros“). Others may represent destructive powers (death instinct, Freud’s „Todestrieb“) We know the traditional quasi-scientific methods within the history of medicine: The mantic methods of dream inter­pretation or interpretation of prognostic signs and visions. The painted images of the saints in the Middle Ages, for example, play an impor­tant role in the religious medicine of the Middle Ages. The power of the icons may be explained by a power exerted by imagination over the body functions. Evil imaginations, sugge­stions by the devil or the demons, on the other hand, could produce illness or death. We may think of the imagery of mon­sters predicting social disaster. The idea of magnetism derives from the cosmological concept of inter­action. Occult powers within the natural world influence the human organism. Magic medicine tries to cure sick persons by so-called magnetic techniques. They tend to strengt­hen the vital forces of the organism: in other words, to accumulate vitality. But there are also destructive powers of magnetism. They weaken vitality and take away life energy – like vampires. The long tradition of magical practices and sym­pathetic cures docu­ments the importance of magnetic influence as a medical idea. Before we deal with paracelsism and mesmerism we should try to construct a rough typology of psychosomatic models. Firstly, the imago may come from outside into the mind, which takes it up and imprints it on the body. This mechanism is called „introjec­tion“ in psychology. Secondly, the imago may originate from inside the human organism, for example, by a disorder of bodily function. In this case the psyche takes up the imago and regards it as a real phenomenon. This mechanism is called „projection“ in psycho­logy. Both these mecha­nisms, introjection as well as projection, may support either healing processes or destructive ones. In a similar way, there are two processes of magnetic activity. Firstly, a magne­tic influence from outside means an input of energy into the body. It is a positive transfer which may be compared to charging a battery. The flow of energy through the medium of the nervous system, for example, aims (as a healing method) at strengthening the vitality. Secondly, there is the model of attraction – of driving out the germ of disease. The magnetic power may attract the pathogenic „seed“ (Krankheitssamen according to Paracelsus). The human organism is considered as a psychosomatic entity into which energy can be introduced (input) or extracted (output) by an outside agent. To this extent the power of magnetism is based on transference of energy. A special method of prophylaxis is the defense mechanism (a term borrowed from Freud’s psychoana­lysis). Special practices such as wearing an amulet, for example, are intended to give protection against both bad images and bad magnetic in­fluences. Paracelsus has been often admired as a genius who attained new insight into the human body and mind and their disorders and gave physicians a philosophical and ethical basis for their practice. But he is by no means the founder of the theory of imagination and magnetism. Rahter, he took up more or less common ideas and attitudes of his period and adapted them to his specific purposes. He is a repre­sen­tative of his time. Walter Pagel is the chief among those who have demon­strated the enormous impact of neoplatonism, alchemy, gnosis, and, last but not least, the cabbala on Paracelsus. He is directly in­fluenced by the platonism of Renaissance thought, especi­ally as repre­sented by Marsilio Ficino (1433-1499) and Giovanni Pico della Miran­dola (1463-1494) of the Florentine Academy, as Pagel has stressed. The influcnce of the cabbala on Paracelsus has usually been underestimated. The religious mysticism of the Jews, its metaphors and symbols, were generally of great interest in the humanistic period. I mention only Johannes Reuch­lin and his fight for the acceptance of the Jewish cabbala. The Christian cabbala developed during the period of the Reformation. Millenianism (chiliasm), Swabian pietism, the Rosi­cru­cians and even romantic natural philosophy and its off­shoots (up to and encluding modern depth psychology) were biased by cabbalistic elements. This aspect was often ignored by the interpreters, at least in the German tradi­tion. It may be a consequence of either open or more subtle antisemitism that they imagined Paracelsus as the „Luther of physicians“ (Lutherus medicorum). He appeared as the incarnation of the German art of healing, a genius fighting against un-German trends in medical theory and practice. This interpretation flourished during the Third Reich, a subject explores by Udo Benzenhöfer recent­ly. Antisemitic and anti-scholastic state­ments by Paracelsus seemed to prove his independence not only of the Jewish tradition but also of the classical authorities of galenism and arabism. Such sentiments, which were not evaluated within their historical context, could be taken to serve as affirmations of nationalistic and imperialistic propaganda. Thus, it was often overlooked „that Paracelsus was a strong admirer on the Caba­lah“, as Kudlien put it. Important concepts of Paracelsus point to cabbalistic sources. I will just hint at his central term Licht der Natur (light of nature). In a treatise belonging to the topic of the „invisible diseases“, Paracelsus identifies the cabbalistic art with the adept’s discoveries in the „light of nature“ within himself: „Look at Adam and Moses and others, they searched for that within themselves that is in man and opened it, and it belongs all to cabbala; they knew no strange things from the devil or [evil] spirits, but from the light of nature; that is what they evoked within themsel­ves.“ The inward approach to the divine sources of the spiritual light recalls the mystical practices of the cabbala (and other religious sub­sy­stems). The successful process depends on a quasi-scientific scholarly self-purifi­cation. From the „Sohar“, the holy scripture of the cabbala, we know about the model of the divine light emanating throughout the material world, the famous doctrine of Sefiroth. Let us come to the main topic. What is the basic model of imagination and magne­tism for Paracelsus? Firstly, the attractive power of the magnet symbolizes the power of imagination, moreover, Paracelsus identifies both powers. “ As the magnet can attract steel, there is also a magnet in the imagination, which also attracts. 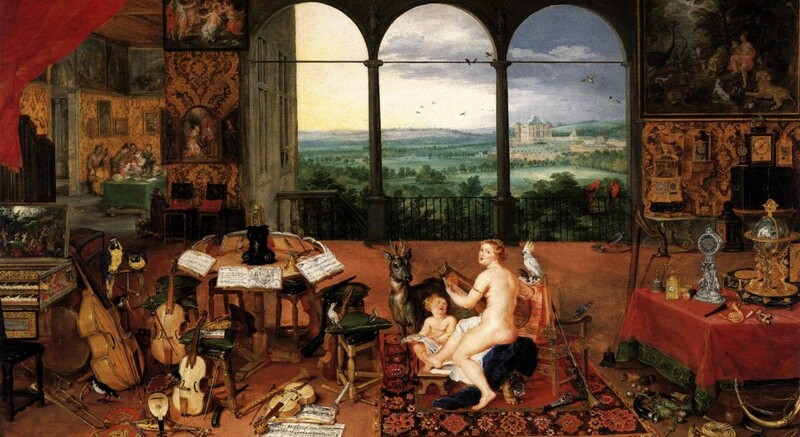 There is an imaginatio like a magnet, and an impressio like the sun and heaven, making a man by the power vulcani.“ Paracelsus gives us an example (Exem­pel), a parable to explain the identity of imagination and magne­tism. The magnet is just a metaphor for imagination: „Without hands and feet, the magnet attracts iron. Like the magnet attracting the visible, the corpora (bodies) are invisibly drawn to the imagination by itself. But it is not the corpus (body) that enters, but what the eyes see and is not palpa­ble, i. e. form and colour …“. There are two steps: the attraction (incorporation) of an object (ding) by the imagination (a quasi-magnet) is followed by an impression of this introjected object, similar to the sun and heaven impressing man. „What climbs up into heaven is imaginatio, and what falls down is impressio born out of the imagination“. This movement describes a sort of reflex action, crossing microcosm and macrocosm. A macrocosmic reflex occurs, for instance, when the (evil) imagination of a human individual poisons the stars, which send back the poison to the earth causing plagues and disorders. Belief which is self destructive Paracelsus calls „despair“ (Verzweiflung). It is a reversal of our belief which makes us weak and sick. The rifle is directed against its owner. The pathological imagination may even give origin to an epidemic, for example a plague or pestilence. The most important cause of plague, therefore, is that people in dispair may „poison heaven, so some will suffer from plague depen­ding on their belief.“ Imagina­tion becomes a very dangerous phenomenon if it is combined with despair, and so returns to its own origin. As it was pointed out before, this mechanism constitutes a sort of a reflex activity. Paracelsus compares persons in despair also with a thief, who hangs himself, being in discordance with god and sentenced to self-hanging. „They are not worthy to be hanged by another [person].“ The wealthy opposite of despair is „simplicity“ (Einfalt), which is a refuge from self-destruction. The magnetism of the herb is compared with the interaction between a magnet and a piece of iron. As the piece of iron can be magnetized by passing the magnet along its surface, so the wound can be magnetized by stroking the herb over its surface. In both cases a correspondence will develop between two bodies, ensuring that magnetic interaction occurs. How this „concordance“ works is a miracle, a great work of God (­“magnale„), a mystery of nature. However, in ad­dition, the magnet is more than a meta­phor. It attracts not only iron or steel, but also all „martial diseases“ (which come from the planet Mars). So, it supports the influence of the Mars, (e.g. diarrhoea or the menstrual bleeding). The magnet can draw the materia peccans to the right place, so it can be digested and then be driven out at the right time. The uterus, the stomach and the bowels are organs which can be influenced directly by the magnet. If the uterus is displaced upwards, it can be driven back by the magnet. The same is possible in the case of epilepsy (falling sickness, fallende Sucht). Some magnets in a certain conformation „drive the illness from the head to the center (sto­mach).“ The magnet can also cure convulsions, stop bleeding, and heal haemor­rhoids. No medical author empha­si­ses the power of the magnet more than Para­celsus. Imagination and magnetism is a main topic for two or three centuries after Para­celsus. The further development of this topic cannot be dealt with in detail here. The dualism between soul and body introduced by René Descartes, the anatomical and physio­logi­cal research on the nervous system and especially the brain (e.g. by Thomas Willis), the new physical paradigms from Kepler to Newton and the development of the physical and chemical analysis of the human or animal organ­ism all specified the concepts of imagination and magnetism. Imagination was increasingly interpreted as an idea fundamentally affecting psychosomatic inter­action. The „invi­sible diseases“ are born of the imagi­nation, explains Paracelsus. The imagination afflicts the spiritual regulation forces, the so-called archeus or archei. A pathological idea (idea morbosa) may infect other human beings and may thus even start an epidemic of dis­ease. The theory of mass psycholo­gy is based on the concept of transferable ideas. The image (imago) seems to be a contagion, like the germ of an infectious disease. The magnetic effect is more and more explained as a natural law, an analogue to Newton’s law of gravitation. Power (Kraft) is a universal phenomenon, an active prin­ciple, as Newton pointed out. The cosmological ether seems to be the medium of power. It penetrates all matter like subtle rays. When Franz Anton Mesmer started with his „animal magnetism“ in Vienna about 1775, it was obviously not a direct offspring of paracelsian thought. As a doctor Mesmer was quite up to date with the scientific development of medicine. In­deed, he was a repre­sen­ta­tive of the Enlightenment, and – as Robert Darnton pointed out – the mesmerists in Paris played an important role in the French Revolution. The classical concept of Mes­mer’s animal magnetism was based on the new concept of electricity and its therapeutic application (electrical therapy), and the fashionable use of steel magnets for the cure of diseases in the second half of the 18th century. Mesmer’s dogma of a universal fluid (Allflut, fluide universel) was nothing other than a credo in Newtonian physics. Mes­mer believed in his new foundation of medicine as a natural science. Strictly speaking he was an „iatrophysicist“. The transfer of energy as a healing power was mediated by the nerves. By his techniques of magnetization (mesmeriza­tion) Mesmer evoked „crises“ (Krisen) which today can only be understood as psychosomatic or psychodynamic group phenomena. But in his self-understanding Mesmer found no place for any­thing called a „soul“ or „mind“. He did not even discuss the theory of imagination. We know that his critics told him that his animal magnetism was nothing more than the effect of the powers of imagi­nation. When mesmerism became an element of the romantic movement and the natural philoso­phy of the early 19th century, the power of imagination was rediscovered. The concept of somnambulism shows us a fascinating combination of the ideas of the power of imagination and the power of magnetism. The altered state of cons­ciousness experien­ced in somnambulism revealed the imagination as a manifestation of nature itself. When a somnambulist patient produced daydreams, visions or prophetic ideas, these were under­stood to be secret messages from hidden (occult) nature. The „Seeress of Prevorst“ (Die Seherin von Prevorst), the famous case history of a patient written by the Swabian doctor and poetrist Justinus Kerner (1786-1862), is a valuable document in the characterization of a concept of the imagi­nation in natural philosophy of the romantic era. The scientific explanation followed the anatomical and physiological guidelines of the age. People could be mesmerized by directing the vital powers within the nerves from the „cerebral system“ to the „ganglion system“. That means, in practical terms, the vital power had to be pulled down from the head to the stomach (abdomen). That could be managed by magnetic manipulations or it could happen spontaneously. When magnetic life (magneti­sches Leben) according to Justinus Kerner arose in the Seeress, the interplay of imaginations could flourish: e.g. the vision of a secret language of nature could develop or the spirit of a dead grandmother could appear. Even healing of other patients by praying at a long distance was reported. Although the romantic speculations about cosmological and religious dimensions of the nature as a whole organism were increasingly rejected by the scientific community in the middle of the 19th century, the mesmerist concept of somnambu­lism provided the first modern psychosomatic model. It was based on anatomical, physiological and clinical findings and furnished physicians with both experimental and treatment me­thods. The research activities of mesmeristic scholars are fasci­nating. Here we see the beginnings of modern psychotherapy, medical psychology and psycho­somatic medicine. It is interesting to notice traditional concepts in medical practice today. Para­psychological mediu­mism uses imagination and visions for practical purposes. The progress of science has not eradicated the human belief that we may call super­stition. Today we also may see a sort of mesmerists practising magnetopathy with magnetic „passes“ and the magnetic tub (Baquet). Last year (1992) I met a psych­iatrist — a medical doctor – at a workshop on hypnosis, and he told me that he successfully uses the magnetic tub for his therapeutic group sessions. During the sessions he imitates Mesmer by wearing a violet robe and applying magnetic „passes“. The motive for such practices is not, I assume, primarily historical interest. It ori­ginates in discontent with the present situation and the hope of coming into contact with the primary natural sources of life. Healing methods by „invisible“ powers are very popular again today. I mention only the so-called spiritual healing and magnetopathy (Heilmagnetismus), with its complex religious, spiritual (and even spiritistic), magical and psychological techniques. These phenomena are often condemned as old superstition, but a histo­rical review should take into account their long tradition in the history of medicine and natural (religious) philosophy. The cabbala, for example, plays an important role in the transfer of religious mysticism to natural philosophy and science in the Renaissance. So, Paracelsus as a philosopher and alchemist may sometimes resemble a cabbalistic scholar more than a laboratory researcher or natural scientist in the modern sense. We should realize the unique situation of paracelsism at the beginning of the modern era. Natural philosophy and natural science were saturated by religious attitudes and rites. Research in the „light of nature“, e. g. the production of new medicines by alchemy, was at once an approach to the light of God, a process of personal purification, and worship. C. G. Jung’s concept of individuation has shown its psychological importance. The „scientific commu­nities“, small groups of adepts with more or less secret rules of behaviour, were essential. Moreover, there were possibilities for friendly discussions between Jews, christians and muslims without repression – at least, this was an ideal, praised among others by Jo­hannes Reuchlin in the trialogue of his treatise De arte cabba­listica. The aspect of intensive communication between mutually respecting scientists appears most important to me. Today we need a multi-cultural („multi-reli­gious“) atmosphere in which intellectuals and scientists can exchange their expe­riences and findings to overcome dangerous prejudices. Abbreviation: Paracelsus, Ed. Sudhoff = Theophrast von Hohenheim gen. Paracelsus: Sämtliche Werke. 1. Abt. Medizinische, naturwissenschaftliche und philosophische Schriften. Hrsg. von Karl Sudhoff. 14 vols. München, Berlin: Barth, 1929-1933. ….. „Paracelsus, Ed. Sudhoff, vol. 9, pp. 251-350; complete title: „de causis morbo­rum invisibilium, das ist, von den unsichtbaren krankheiten und iren ursachen“. ….. Cf e.g. Werner and Annemarie Leibbrand:Die „kopernikanische Wendung“ des Hysteriebegriffs bei Paracelsus. In: Paracelsus, Werk und Wirkung. Festgabe für Kurt Goldammer. Hrsg. von Sepp Domandl. Wien: Verband der wissenschaftlichen Gesell­schaften Österreichs, 1975; S.125-132. ….. On the concept of sympathy and its metaphoric use in the history of medicine; see Heinz Schott: Sympathie als Metapher in der Medizingeschichte. Würzburger medizinhistorische Mitteilungen 10 (1992), pp. 107-127. ….. The Freudian terminology is very clearly pointed out by J.Laplanche and J.-B.Pontalis: Das Vokabular der Psychoanalyse. Frankfurt am Main: Suhrkamp, 1973 (suhrkamp taschenbuch wissenschaft; 7). Cf the articles on „Eros“, pp. 143-145 and „Todestriebe“, pp. 494-503. ….. The mantic interpretation of monsters (Latin: „monstra“) as signs of sin and moral decay have an important impact on modern behaviour against children born with mal­formations; cf Heinz Schott: Die Stigmen des Bösen: Kulturgeschichtliche Wurzeln der Ausmerze-Ideologie. In: Wissenschaft auf Irrwegen: Biologismus – Rassenhygiene – Eugenik. Edited by Peter Propping und Heinz Schott. Bonn; Berlin: Bouvier, 1992; pp. 9-22. ….. The term „Od-vampirism“ (Od-Vampirismus) describes the negative (weakening) powers of persons in the middle of the 19th century according the „Od“ theory of the German chemist Carl Reichenbach; cf Karl Spiesberger: Justinus Kerners „Sehe­rin von Prevorst“ in Betrachtung esoterischer Tradition und im Lichte psychischer Forschung. In: Erich Sopp and Karl Spiesberger: Auf den Spuren der Seherin. Sersheim: Osiris, 1953; p. 64. ….. Cf reference 2: Laplanche/Pontalis, article „Abwehrmechnismen“, pp. 30-33. ….. In this regard we may compare him with Sigmund Freud, who represents the spectrum of the scientific and cultural currents of the 19th century at the turn of the century. ….. Cf Walter Pagel: Das medizinische Weltbild des Paracelsus: Seine Zusammen­hänge mit Neuplatonismus und Gnosis. Wiesbaden: Franz Steiner, 1962; more detailed in Walter Pagel: Paracelsus. An Introduction to Philosophical Medicine in the Era of the Renaissan­ce. 2nd, revised ed Basel; München etc. : Karger, 1982; pp 284-289. The importance of Ficino’s and Pico’s theory for magia naturalis is pointed out by Wolf-Dieter Müller-Jahncke: Astrologisch-magische Theorie und Praxis in der Heilkunde der frühen Neuzeit. Stuttgart: Franz Steiner, 1985; pp. 33-41. ….. Cf Max Brod’s introduction to Reuchlin’s life and work; see note 45. Recently an anthology appeared in print covering the whole topic: L’Hébreu au Temps de la Renaissance. Ed. by Ilana Zinguer. Leiden; New York; Köln: Brill, 1992; see especially the article by Christoph Dröge: „Quia Morem Hieronymi in Transferendo Cognovi…“ – Les Débuts des Etudes Hébraiques chez les Humanistes Italiens“, pp. 65-88. ….. Walter Pagel: Paracelsus. An Introduction to Philosophical Medicine in the Era of the Renaissance. Basel u. a.: Karger, 1982; p. 214. ….. This expression appeared as a term of abuse in Basel, where Paracelsus taught as a profes­sor 1527/28; it was also used afterwards in a positive sense; cf Ernst Kaiser: Paracelsus, mit Selbstzeugnissen und Bilddokumenten. Reinbek bei Hamburg: Rowohlt Taschbenbuch, 1984; p. 88. ….. Cf Udo Benzenhöfer (among other articles): Zum Paracelsusbild im Dritten Reich unter besonderer Berücksichtigung der Paracelsusfeier in Tübingen/Stuttgart im Jahre 1941. In: Paracelsus, Theophrast von Hohenheim: Naturforscher-Arzt-Theolo­ge. Ed. by Ulrich Fellmeth and Adreas Kotheder. Stuttgart: Wiss. Verl.-Ges., 1993; pp. 63-79. ….. Fridolf Kud…..lien: Some Interpretive Remarks on the Antisemitism of Paracel­sus. In: Science, Medicine and Society in the Renaissance. Ed. by Allen G. Debus. New York: Neale Watson Academic Publications, 1972; pp. 121-126. Kudlien refers to Walter Pagels interpretation. ….. Cf. Gershom Scholem: Zur Kabbala und ihrer Symbolik. 7th ed. Frankfurt a.M.: Suhr­kamp, 1992; pp. 16-17; 53-54. ….. Der Sohar. Das heilige Buch der Kabbala. Ed. by Ernst Müller. 5. Aufl. Mün­chen: Diederichs, 1991; p. 50; cf. also pp. 49-52 and 76-78. ….. „als der ganz himel ist nichts als imaginatio, derselbige wirket in den men­schen, macht pesten, kaltwehe und anderst.“ Paracelsus, Ed. Sudhoff, vol. 14, p.311 (present author’s translation fo the original quotations). ….. „nun was ist imaginatio anderst, als ein sonn im menschen, die dermaßen wirket in sein globum, das ist, do hin sie scheint?“ Paracelsus, Ed. Sudhoff, vol 14, p.310. ….. „dan kan der magnes an sich zihen stahel, so ist auch ein magnet do in der imagination, wie ein magnet und ein impressio, wie die sonn und wie der himel, der ein menschen macht in der kraft vulcani.“ Paracelsus, Ed. Sudhoff, vol. 14, p. p. 313. ….. „der magnet zeucht an sich das eisen on hend und füß. zu gleicher weis wie also der magnet das sichtig an sich zeucht, also werden auch die corpora unsichtig durch die imagination an sich gezogen. nicht das das corpus hinein gang, sonder das get hinein, das die augen sehen und nicht greiflich ist, also die form und die farbe…“; Paracelsus, Ed. Sudhoff, vol. 9, p. 290. ….. „und das herauf kompt in himel, ist imaginatio und wider herab felt, ist impressio, die geboren ist aus der imagination.“ Paracelsus, Ed. Sudhoff, vol. 14, p. 314. ….. Cf Paracelsus, Ed. Sudhoff, vol. 14, p. 317. ….. Paracelsus, Ed. Sudhoff, vol. 9, p. 287. ….. „… das sie den himel vergiften, das er etlichen pestilenz gibt, nach dem ir glaub ist.“ Paracelsus, Ed. Sudhoff, vol. 9, p. 280. ….. „nich wert das sie ein ander henk“; Paracelsus, Ed. Sudhoff, vol. 9, p. 358. ….. Cf Paracelsus, Ed. Sudhoff, vol. 9, p.357. ….. „Damit und ir den brauch des krauts verstanden, so sollent ir wissen, das in der gestalt gebraucht wird, nemlich man nimpt das kraut und zeuchts durch ein frischen bach, demnach so legt mans auf das selbig, das man heilen wil, als lang als einer möcht ein halb ei essen. darnach so vergrabt mans an ein feucht ort, domit das faul werde, so wird der schad gesunt in der selbigen zeit. …das etlich ein kreuz uber die scheden machen, etlich beten darzu; solch alles ist von unnö­ten, gehört nit darzu, dan es ist ein natürliche wirkung do, die das natürlich tut, nit superstitiosisch und zauberisch.“ Paracelsus, Ed. Sudhoff, vol. 2, p. 18. ….. Cf the chapter on the magnet in Herbarius: Paracelsus, Ed. Sudhoff, Vol. 2; pp. 49-57. ….. The reflex model introduced by Descartes and the brain research especially by Willis is clearly analysed and illustrated in Edwin Clarke and Kenneth Dewhurst: Die Funktio­nen des Gehirns. Lokalisationstheorien von der Antike bis zur Gegen­wart. München: Heinz Moos, 1973; pp. 69-74. ….. Cf Paracelsus, Ed. Sudhoff, vol. 9, p. 279-280. ….. Heinrich Feldt studied the concept of power in regard to the history of magnetism in detail, especially from Kepler and Newton until the 18th century and the concept of mesmerism; cf Heinrich Feldt: der Begriff der Kraft im Mesmerismus. die Entwicklung des physikalischen Kraftbegriffes seit der Renaissance und sein Einfluß auf die Medizin des 18. Jahrhunderts. Med. Diss. Bonn 1990. ….. Mesmers scientific ideas are very problematic; cf e.g. Ernst Florey: Franz Anton Mesmers magische Wissenschaft. In: Franz Anton Mesmer und der Mesmeris­mus. Wissenschaft, Scharlatanerie, Poesie. Hrsg. von Gereon Wolters. Konstanz: Universitäts­verlag, 1988; pp. 11-40. Nevertheless, as a member of the medical faculty in Vienna, Mesmer was well informed about scientific standards. ….. Cf Robert Darnton: Mesmerismus und das Ende der Aufklärung in Frankreich. München: Carl Hanser, 1983 (Original: Mesmerism and the End of Enlightenment in France; 1968). ….. Cf Heinz Schott: Die Mitteilung des Lebensfeuers. Zum therapeutischen Konzept von Franz Anton Mesmer (1734-1815). Medizinhistorisches Journal 17 (1982), S. 195-214. ….. See Heinrich Feldt: The ‚force‘ of imagination in the medicine of late eighteenth century Germany. In: Proceegins of the 1st European Congress on the History of Psychiatry and Mental Health Care. Ed. by Leonie de Goei and Joost Vijselaar. Rotterdam: Erasmus Publishing, 1993; pp. 25-31. Gereon Wolters pointed out the scientific problem of Mesmer’s theory refused by two commissions in Paris; he analysed the report at the Royal Academy of Sciences as an epistemological document of the Enlightenment; see Gereon Wolters: Mesmer und sein Problem:: Wissenschaftliche Rationalität. In: Franz Anton Mesmer und der Mesmerismus. Wissenschaft, Scharlatane­rie, Poesie. Hrsg. von Gereon Wolters. Konstanz: Univer­sitätsverlag, 1988; pp. 121-137. ….. On Kerner’s exorcistic manipulations see Heinz Schott: Zerstörende und heilende Bestrebungen des „Magnetischen Lebens“: Kerners Forschungsperspektive im Kontext der zeitgenössischen Medizin. In: Justinus Kerner, Jubiläumsband zum 200. Ge­burtstag. Teil 2. Weinsberg: Nachrichtenblatt der Stadt Weinsberg, 1990; pp. 443-450. ….. Justinus Kerner: Die Seherin von Prevorst. Eröffnungen über das innere Leben des Menschen und über das Hereinragen einer Geisterwelt in die unsere. 2 Teile. Stuttgart; Tübingen: Cotta, 1929. ….. See Heinz Schott: Der ‚Okkultismus‘ bei Justinus Kerner – Eine medizinhistori­sche Untersuchung. In: Justinus Kerner: Nur wenn man von Geistern spricht. Briefe und Klecksographien. Hrsg. von Andrea Berger-Fix. Stuttgart: Edition Erdmann, 1986; pp. 71-103. ….. I remember the pioneering work of Henry F. Ellenberger: The Discovery of the Unconscious. 2 vols. Bern: Huber, 1973. Ellenberger shows the importance of mesme­rism and somnambulism for the development of modern ‚dynamic psychiatry‘. ….. Cf. e.g. C. G. Jung: Einleitung in die religionspsychologische Problematik der Alchemie. In : C. G. Jung: Gesammelte Werke, vol. 12; pp. 17-54. ….. Max Brod emphasized this aspect especially in his sympathetic book: Johannes Reuchlin und sein Kampf. Eine historische Monographie. Stuttgart u.a. : Kohlhamm­mer, 1965. ….. „du findest ein man, der kan reden, das im alle welt zulauf, und hört im zu. nu wiß, das das maul ein magnet ist, zeucht an sich die leut in der kraft.“ Paracelsus, Ed. Sudhoff, vol. 9, p. 363. Dieser Eintrag wurde veröffentlicht in animalischer Magnetismus, Franz Anton Mesmer, Imagination, Magnetismus, Mesmerismus, Paracelsus, Uncategorized und verschlagwortet mit animal magnetismus, animalischer Magnetismus, Glasgow, imaginatio, imagination, invisible diseases, magnetism, Medizinhistorisches Institut der Universität Bonn, mesmerism, Mesmerismus, Paracelsus, Wellcome Unit for the History of Medicine von Heinz Schott. Permanentlink.